STI closed at 2729.91 today, officially in a bear market declining 23% since its 1-year high of 3,539.95 on Apr 2015. While many are busy selling yesterday and today, I am busy buying. This is according to my strategy since being patient for several months now. Remember your strategy is only as good as what you had planned earlier. What you plan is only as good as what you learnt. What you learn is only as good as how much you understand your own situation the best. Therefore understand yourself well. Different people will have different strategies. 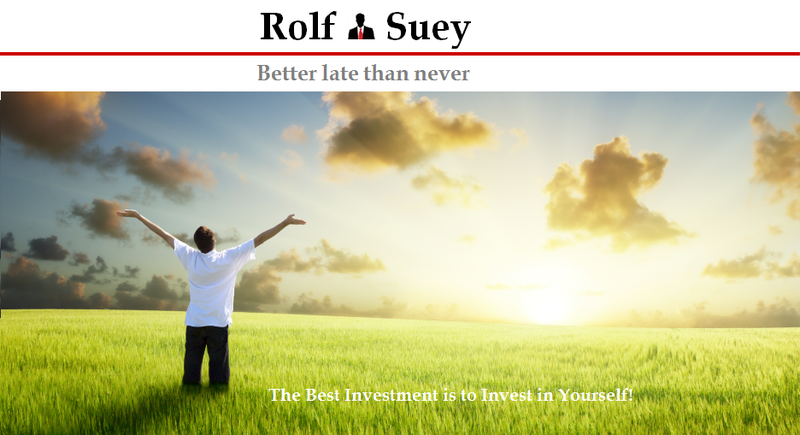 Very often, it also depend on other financial or real life factors outside your stock portfolio, such as your work stability, any family stress, or personal mental well-being or even ask if your health be affected. The “spare cash” or “warchest” like many people here in the blogosphere like to refer to as, has to be deployed over a period of time during bear market. One of the ways of deploying as very rough guide is written by Motley Fool – Refer here. Similarly, you can also create your own spreadsheet. Something like below and play with the percentages and figures accordingly base on the situation that suit you the best. 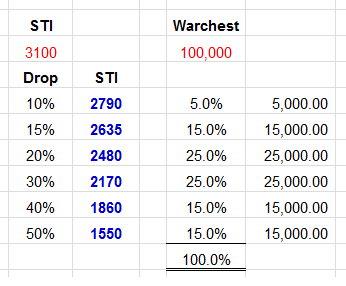 Below is an assumption of a 100k warchest with arbitrary percentage of warchest deploy. Well. I also thinking to buy GLP and sing post. Today I scope ocbc. Dbs and Kepple corp.
Hope it turns out good. Do remember that banks & O&G r very volatile! For stocks I m not so sure esp in these two industries now, I give a pass! But regardless the case in the short term, these r good companies for the long term. Lol....me still waiting to get cmp. After got in on ocbc and singtel. Hmm... CMP is whipped heavily. The key next is how they r gg to sustain their dividend. Well post and i read this this article and its give us good lesson how to help us thanks for sharing rephrase my sentence .